Yesterday night, Sunday, February 12, 2012, pandemonium, fear, anxiety and bloodshed characterized the Joint Task Force’s (JTF’s) manhunt for members of the Boko Haram sect in Budum community, located near the place of the Shehu of Borno, in Maiduguri, Borno State. There are growing concerns that the fundamental rights and freedoms of local residents may have been threatened and violated in the course of JTF’s anti-insurgency operations. The JTF soldiers allegedly invaded the community at about 9 p.m., shooting sporadically, burning buildings as they conducted a house-to-house search for members of the Boko Haram sect. Fearing violent attacks by the soldiers, many families, especially young men fled their homes and sought refuge in a local mosque in the community. The first call came in at 9.15 p.m. The Hausa accent was too thick, and I could hardly comprehend the information being conveyed to me. But from the tone of the messenger, there was trouble. Few minutes later, another call came in from a local contact that calls me regularly. Fear, apprehension was clearly evident in his entire narrative. Without the regular exchange of pleasantries, he informed about the heavy presence of soldiers in their community, and that some buildings were allegedly being burnt with occupants inside. The caller hung up immediately, giving me no time to interrogate his claims. Almost immediately, another call came through. 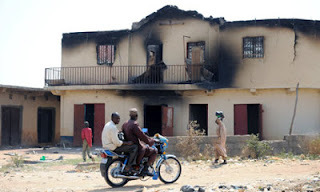 “Villagers are trooping to the mosque to hide. Deafening gunshots have caused residents, especially our women and children to scamper for safety. Soldiers are moving from house-to-house looking for our men, and burning down some houses. Please come to our help”. That was the local Imam that lives beside a small mosque in Budum community, near the Shehu of Borno’s palace. The news left me speechless and confused for several minutes. I was jolted back to consciousness by two subsequent calls from unfamiliar numbers and callers. I always pick my calls as long as its work related. Somebody must have spread my number round urging people to call me. Then, the 5th caller or so came through, this time around, a woman. I could hear the screams of children in the background. I could hear several voices and jostling feet as though people were running. That call came in exactly at 10.01 p.m. That particular call hit me like a thunderbolt, and I knew right then that it wasn’t a hoax. The JTF routinely applies a combatant policy that designates any area used by the sect to perpetrate their operations as a military target. “Persons who allow their surroundings or frontage to be used by the Boko Haram sect to attack people or security agencies would be considered as collaborators, and will be treated as criminals,” JTF told me during a fact-finding mission to Maiduguri in July last year. In response to a major bomb blast that wounded three soldiers on Saturday, July 23, 2011, a similar reprisal attack by the JTF in Budum community left three men – Late Mallam Goni Tijani, (55), Late Babakura Zakariya (18), Late Idris M – dead. They were allegedly shot dead in front of their homes by the JTF soldiers following a violently rigorous house-to-house search. Could that be the reason why the men in particular, escaped at the sight of the soldiers? First off, I sent text messages to some senior members of the Joint Task Force in Maiduguri. I began to call everyone I knew that had some influence and access to the people “above”, including my contacts and colleagues in the local media, Amnesty International, United Nations and other international organizations. Lucky enough, I was able to speak with the JTF authorities exactly at 10.05 p.m. They confirmed the incident, explaining that some of their men had been attacked and killed by the Boko Haram sect hiding among residents within Budum community in Maiduguri. Two soldiers were allegedly, severely wounded and hospitalized. “Yes, we have launched a house-to-house search to fish out the assailants, but we are observing the rules of engagement. We are rescuing the women and children first….But they must produce their husbands…The Boko Haram members are using the mosques as a shield”, said JTF. For me, the JTF’s statement was a corroboration of the community narratives, or at least, it helped to fill in the blank spaces. From the various narratives of the residents, the JTF, and private citizens, it is easy to deduce an extremely violent reprisal attack had taken place. About five houses have been burnt down in Budum community. Several persons were arrested and taken to an undisclosed location while many families still await the return of their loved ones and family members. The number of the dead casualties remains unknown, but it hovers between 12 and 15. Between July 24-27, 2011, I conducted a fact-finding mission to Maiduguri to gain first-hand information into the root causes of the Boko Haram insurgency as well as fully understand governmental responses to the mounting insecurity in the northern part of the country. As stated in the mission report, the ‘In the Killing Fields of Maiduguri”, the Nigerian Government must take urgent and concrete measures towards reviewing and re-directing the operational methods, processes and procedures of the Joint Task Force to be in tune with the democratic environment and attributes of the rule of law, due process and respect for human rights. When the state fails to prevent systematic denials or violations of citizen’s right, and paying due regard to the special needs of women and children especially in periods of emergency, this failure is a fundamental human rights violation. Absolute mistrust, suspicion, and fear characterize the relationship between the security operatives and the local populations, undermining intelligence undertakings that would lead to the definite identification and extirpation of the sect’s members and activities. Areas lived by the poor are often criminalized and labeled as Boko Haram hideouts to justify the extreme security surveillance and violent incursions by soldiers. Often, these incursions are accompanied by severe violence, with victims on many occasions arrested, detained and in some cases, killed. Based on the sentiments shared by several persons interviewed in Budum Community in July last year, I realized that the greater the force employed by the JTF in the areas designated as military targets, the greater the sympathy those affected communities have for the Boko Haram sect, to the extent that majority of them are hesitant or outrightly unwilling to provide information to the police on the hideouts and activities of the sect members. While acknowledging the bravery and commitment of the JTF soldiers toward stamping out vicious elements behind the violence, insecurity and fundamentalism witnessed in the northern part of the country, concrete steps must be taken to integrate respect for human rights into their engagement strategies, peacekeeping and peace-building efforts. Most importantly, strengthening respect for human rights is a critical step towards the re-establishment of a climate of peace in the northern region. Excuse me pamela, In as much as I respect ur sense of decency and your charismatic personae that has endeared fans and friends to you. I felt its time you try to balance emotions or if possible separate them away from your job or judgement if you are to succeed in this social crusader stuff and journalism profession. This post reveals completely an emotion-riddled fantasy and judgement which has rendered the authenticity of this post nothing other than a personal effort to protect the interests of your personal contacts in bundum. pls, if you must expect us to continue to correspond properly as friends on fb and for us to follow ur blog, pls desist from such mundane acts which undermines the cause of justice.